The Mill Breeder Web Site is now OPEN! these innocent little ones in the conditions that they are in. made about the problems, or the passing of your babies my heart hurts with you. The Mill Breeder Project Team! Hooray! This is a great step in the fight against mill breeders! Thanks to everyone that had a hand in it! Dunno how I missed this. The site looks great Linda. You know I support this effort 100%. Thank You for all you do. The Season is nearing, and we need to tighten up with our program in getting as many members involved with helping. the fall season please let us know. on the venues will be a tremendous help. TOGETHER WE ALL CAN MAKE A DIFFERENCE! If anyone is interested in assisting, please let us know. Time is running out, and we are ready to go! Well done, Linda! Remember, some of the larger regional areas (such as Cincinnati, and I would suppose other larger cities) run flea markets year round - every weekend. I have a friend who goes to Caesar's Creek and Turtle Creek quite often, and she sees gliders there regularly. I already submitted this info to Kate, a long time ago, so you have what I know about. I'll check in at your site, though, to be sure all the info is still current. Wow that is awesome!!!!! 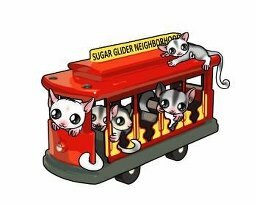 Yea here in Texas there are places that sell gliders year round such as Canton (1st monday), sandmans sugargliders(every weekend) in Arlington and others I cant think of at the moment. Sending you a PM......................I want to help! Just a reminder - if you are interested in more information about the Mill Breeder Project, or would like to learn how to help, please let us know. Subject: Re: The Mill Breeder Web Site is now OPEN!